In celebration of the Speedway's 100th Anniversary, the 2009 ticket has several features reminiscent of tickets from years past, most notably the fonts used for the Admission to Grounds, Gatemans stub and Rain Check, the IMS logo above and behind Scott Dixon's car and the words "International Sweepstakes" at the top which returns for the first time since 1980. The 2011 ticket is similar in that it says “International 500 Mile Sweepstakes” A signature, that of Tony George CEO, is at bottom right which also has not been on a ticket since 1980. The winning car and driver are also width-wise across the ticket which is the first time since 1991. The stub size is still about 6 1/4” x 3” with the unused ticket size still 8 1/2” x 3” - it will remain so through 2015***. The Indycar series sponsor Izod appears on the 2010 ticket marking the first time a logo besides the ‘500’ event logo appears. The 2012 ticket goes back to a vertical format like 1995 through 2008. Long lines occurred at the gates in 2013 due to the heightened security from the Boston Marathon bombing the month prior and ticket takers were also tearing a majority of tickets. This may mean unused 2013 tickets could be more difficult to find in the future. To ease entry into the Speedway after many fans complained of the long lines in 2013, the Speedway began the practice of marking tickets on the front or back with a pen instead of tearing them. This does not mean all 2014 tickets were untorn, but rather a more substantial portion were probably untorn than in previous years. Tony Kanaan along with faces on the Borg-Warner Trophy and the event logo are embossed. The large general admission ticket it is not embossed which will be the case for all subsequent years*. 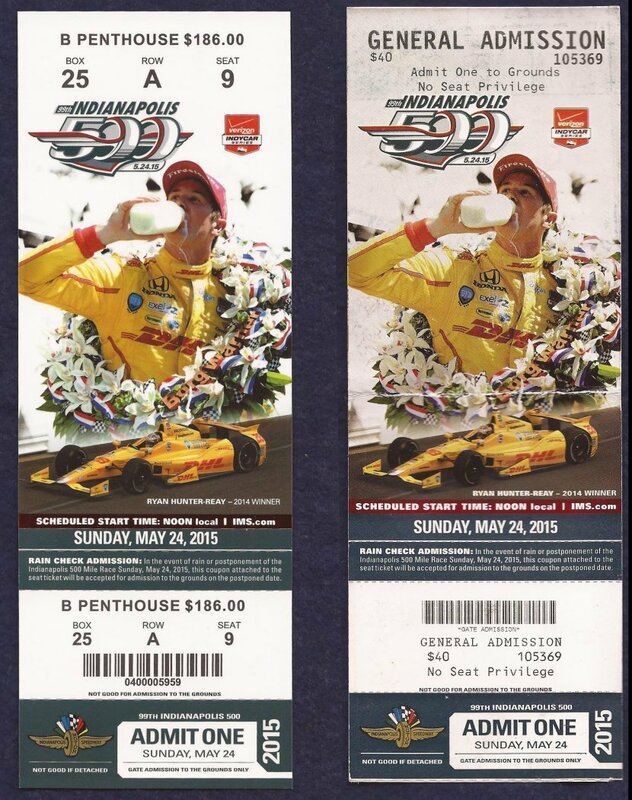 Only the Indycar series logo is on the 2014 ticket as Izod was no longer the series sponsor. While some tickets may still have been torn in 2015, the vast majority were now either marked with a pen or scanned so even more tickets will be found unused. Ryan Hunter-Reay, his car, event logo and the new Indycar series sponsor Verizon are embossed on the 2015 ticket. 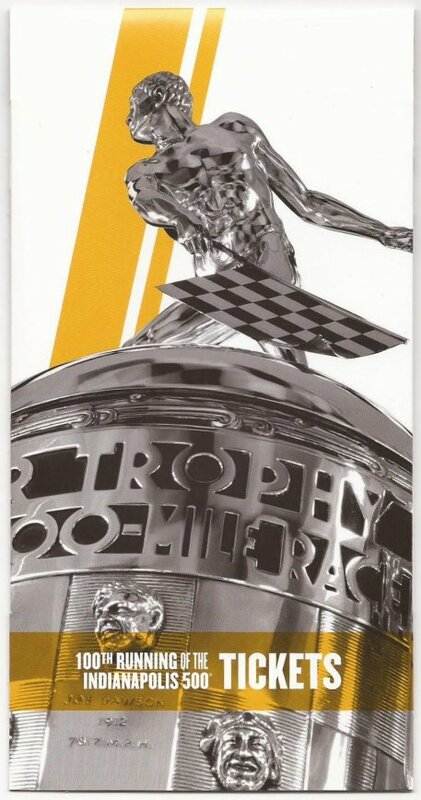 For the 100th Running of the Indianapolis 500, the Speedway issued a special one time only plastic ticket to current ticket holders. Current ticket holders also had their plastic tickets presented in a special thin cardboard fold out holder (see below). Current ticket holders will receive their tickets in a holder from this date forward. The plastic ticket measures 7 1/2” x 3”. There is a tab at the top of the ticket where one could clip on a lanyard so it could worn around the neck if so desired. ALL 2016 plastic tickets are considered unused whether the lanyard tab is intact or not (some fell out any way even though the lanyard tab wasn’t used). For those tickets sold to walk up and general admission customers a traditional paper ticket was issued which had only the gold (sometimes gold photographs or scans as black) “100th Running” at top left embossed and for the first time in Speedway history, there are no perforations to a paper ticket. This will be the standard for all paper tickets in subsequent years. The Speedway was scanning all tickets by this time so the vast majority of these tickets will be found unused. The 2017 ticket goes back to paper and is horizontal for the first time since 2011. The overall size shrinks to 8” x 3” which will be the standard size for all subsequent years. The ticket holder for 2017 does not fold out like the 2016 holder. Embossed on the ticket are: the event logo, Verizon logo, IMS.com at lower left, the entire image of Alexander Rossi, co-owners Michael Andretti and Bryan Herta at Rossi’s right, Admit One and 101st Running of the Indianapolis 500 at upper right. The 2018 ticket goes back to vertical with Takuma Sato, the event logo and Admit One embossed. The majority of grandstand tickets are outlined in red at the top and top left while the outline on the Tower Terrace ticket at top middle is silver (sometimes silver photographs or scans as gray). Note that this ticket has no price and is also marked Complimentary at lower right by the bar code. The general admission ticket is outlined in light blue. Note the Stand H ticket at top right has a $0.00 price indicating it is complimentary and stamped on the back is “Military Ticket Not to Be Resold”. Note that the general admission ticket at bottom left has an established price of $35.00 while the one at bottom middle is $0.00 which indicates it is complimentary even though it is not marked as such. Red, Silver and light blue are the only known outline colors for grandstand tickets but there may be others*. Tickets from 2009 to the present are easy to find but if one had to choose a ticket which might be difficult to find in the future it would be paper tickets from 2016. *** The used ticket size may vary slightly year to year but the over all ticket size doesn’t change unless noted.